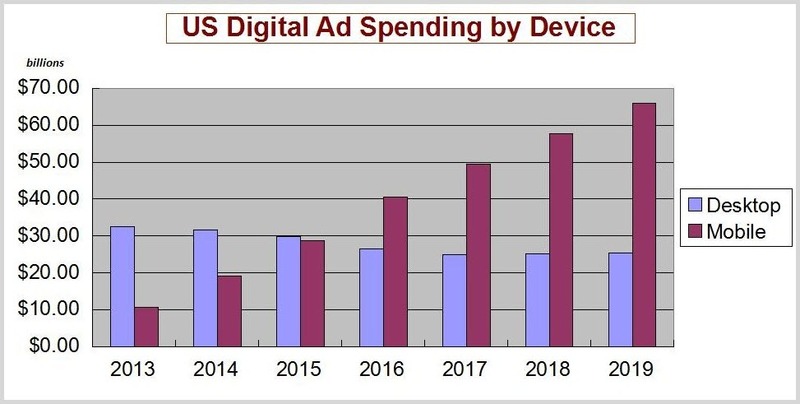 Mobile marketing spend is predicted to hit $65 billion by 2019 in the US. This figure in itself may possibly be meaningless in Australia, but the graph illustrating it, clearly shows the expected lineal growth of mobile versus desktop, which will impact us. Mobile users are picky. They have low tolerance for poor mobile experiences. If your mobile site loads slowly, 43% of your users won’t try to come back and most will go to a competitor’s site, according to data from e-commercefacts.com. Today’s mobile users have high expectations. As well as loading quickly, mobile sites must look great, be easy to navigate and create an overall satisfying experience. Only then will users downsize from the desktop. Getting them to this point requires some effort. Below are my top 9 tips to help you get started. When it comes to online marketing, your mobile strategy should be an indispensible part of your digital marketing strategy, co-habitating comfortably alongside your SEO, Content Marketing, Paid Advertising and Social Media strategies. 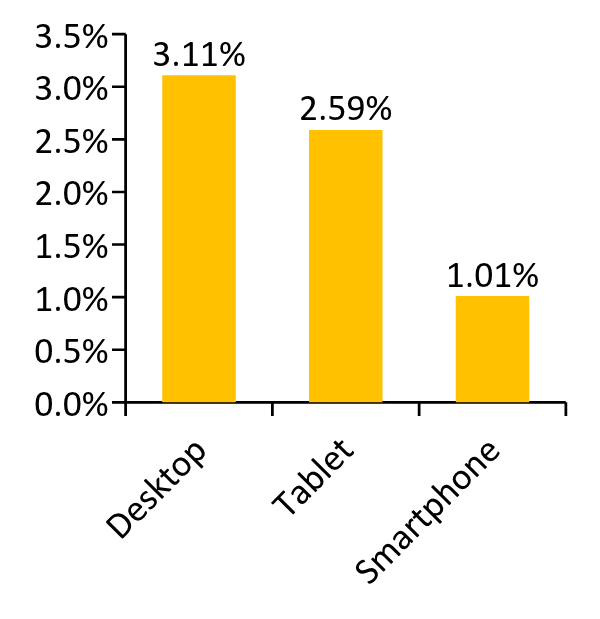 It should acknowledge that users might spend lots of time researching on mobile devices, but when it comes to purchasing, they switch to desktop. Why? Some of the problem is inherent to mobile. There are indeed some features of mobile devices, especially smartphones, that discourage placing an actual order. For starters, the screen size isn’t optimal for shopping (https://conversionxl.com/make-mobile-convert/). Secondly, the network speed makes for (uncomfortably) slow shopping experiences. That’s not fun. As a result, users in general, are afraid of making a purchase mistake. They are unsure about the ‘product look’. They fear the product itself might be missing some key information. And they can worry about whether they are missing out on better products. If there’s a consensus about anything in the fast-changing mobile market, it’s the idea that mobile eCommerce conversions are lower than they are on personal computers. Smartphones have the lowest conversion, but tablets are also generally seen as lower than computers. So, what to do? Don’t give up, I say. Faced with these built-in limits, it’s tempting to accept the lower mobile conversion rate as something that can’t be helped. Companies sometimes tell us they’ve made mobile a lower priority, shunting it off to the side, or starving it of resources. Instead, my advice is to take the time to investigate how your visitors use mobile and how you can create an experience that fits within their existing usage patterns. For example, see the TIP 4 about making the call option visible: and TIP 8 about allowing users to continue checkout on another device. Any ecommerce website should create a sense of urgency at some point during the shopping experience. Instead of using the same one-trick pony on all devices, let users know that you are aware they are using a smartphone or tablet, and offer them something that is exclusive to mobile shoppers. To maximize conversions, also consider offering something if ‘anything’ is put into the shopping cart, which can then be checked out with ‘any’ device within the next 24 hours. National Wholesale Liquidators provides a good example of advertising a specific offer, rather than a generic promotion. The company offered $5 off purchases of $25 or more, if customers were willing to opt in to its mobile marketing campaign. This not only created a database of more than 50,000 customers contact numbers; but research done after the campaign showed that the customers who had opted into the campaign, spent as much as 80% more, than those who hadn’t. People don’t like filling out forms and they hate it even more when the form is complex. Since mobile users are looking for quick answers to easy questions, their likelihood of filling out a form of more than three fields is slim to none. According to the Director of Strategy at Three Deep, every added form field (beyond three) slashes mobile conversion by 50%. Your mobile website is more likely to convert if you keep your forms simple, and allow guest checkouts as well as 1-click checkouts for return customers. Little things like suggesting the address with a Google Maps plugin while the shipping information is being filled in, as well as a visual calendar instead of numeric dates, make the checkout experience more intuitive and avoid abandoned shopping carts. If you have a small e-commerce site that processes payments with PayPal, also consider using Amazon Payments which allows customers to login with Amazon and pay with Amazon while never navigating away from your website. 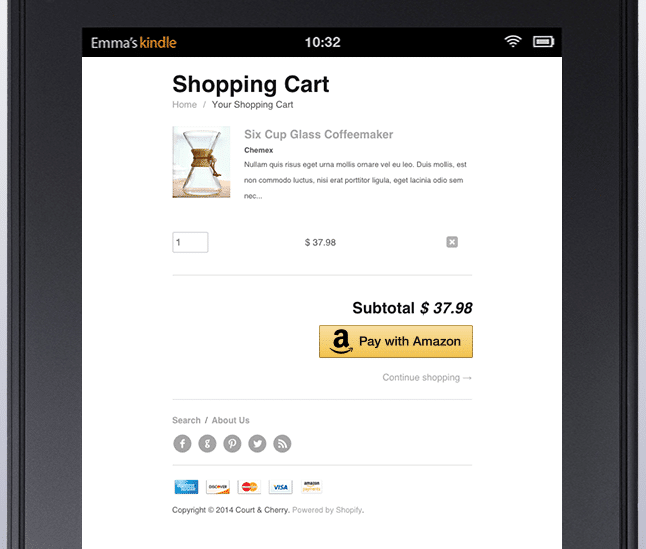 It costs about the same and has a stellar 1-click mobile checkout process. A new survey of 3,000 mobile searchers who recently made purchases in seven verticals (Travel, Restaurant, Auto, Local Services, Retail, Finance, Technology) revealed that 70% of mobile searchers click to call a business directly from Google’s search results. 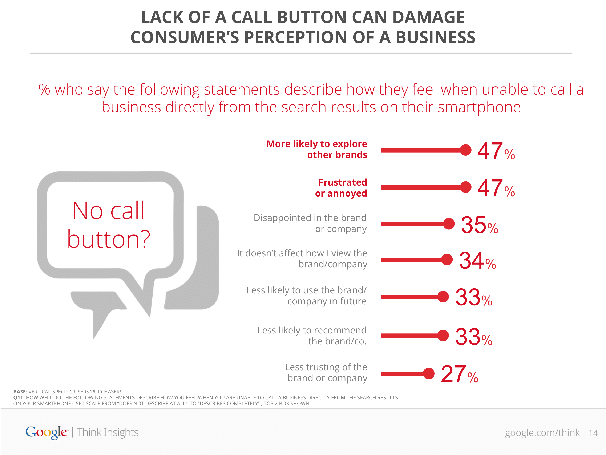 Nearly half indicated that they are more likely to convert elsewhere if they can’t call a business directly from the search result. 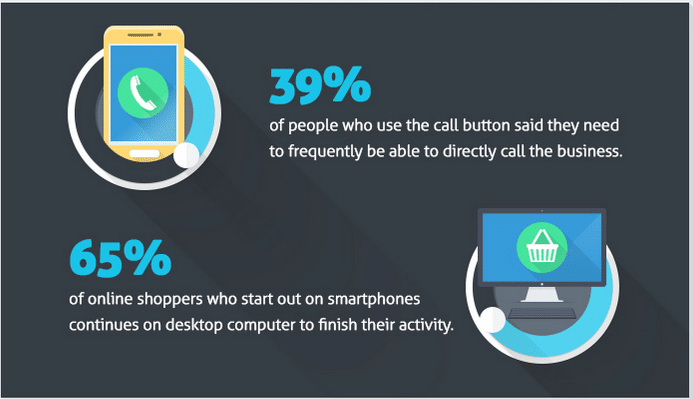 The same survey found that more than 60% of users consider click-to-call functionality as the most important aspect of their online mobile experience. 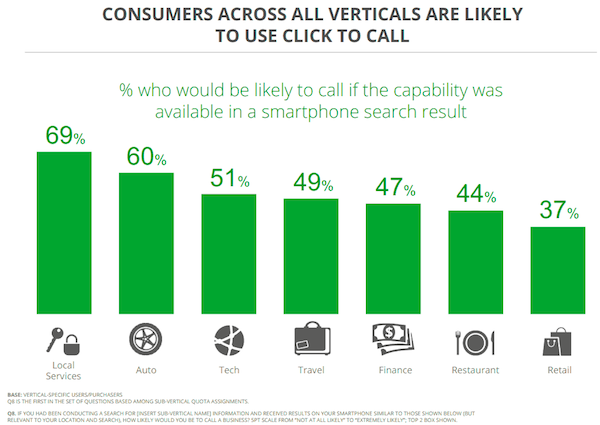 Those click-to-call buttons are extremely useful, especially when you consider that 70% of mobile searchers have used the call button and are likely to do so again. Another survey by mobile app developer, MobileAppHelp found that its smaller mobile applications for health spas and restaurants, experienced exponential growth in bookings simply by relocating the click-to-call button onto the home screen. If you’re a bricks-and-mortar business looking for leads, foot traffic, orders or customers, in general, the click-to-call button is your best friend. Important content should be above the fold. This means it should be on the part of the page that’s immediately visible when it first opens. Websites on PCs or laptops can contain multiple call-to-actions on one page. These sites give you more room to work with. On a product page you often see that there’s not only a ‘place in shopping cart’ button, but also a link (or heart) to put this product in your favourites, buttons to share something on social media, etc. In a checkout you will often also be given the option to sign up for an e-mail newsletter. When you’re optimizing for mobile devices the most important thing to remember is simplicity. A mobile website can become very cluttered very fast (it’s a relatively small screen) but it’s important to keep a visitor’s focus. 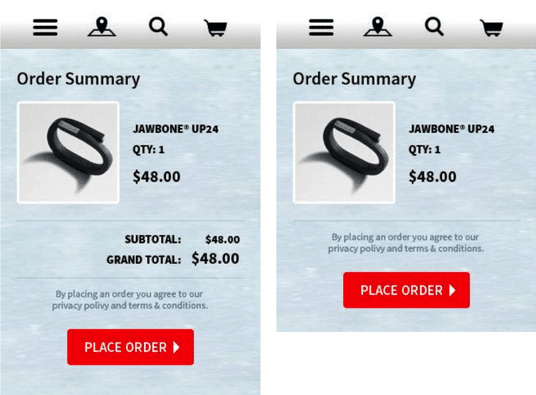 Because of this: eliminate micro conversions on your mobile website. Removing the two micro conversions instantly caused an uplift in conversions. 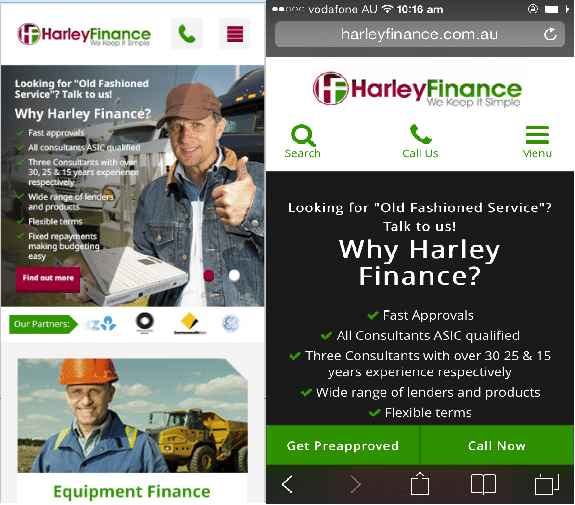 Pop-up banners are one of the biggest conversion rate killers a mobile site can have. Not only is it difficult to skip, but it interrupts the thought process of a potential buyer. The mobile shopping experience should be as fast as possible. 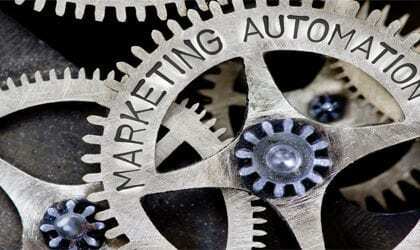 Any additional click or distraction lowers the conversion rate and dramatically increases the drop-off rate. An image carousel is a revolving group of images. They kill conversions, especially on mobiles. 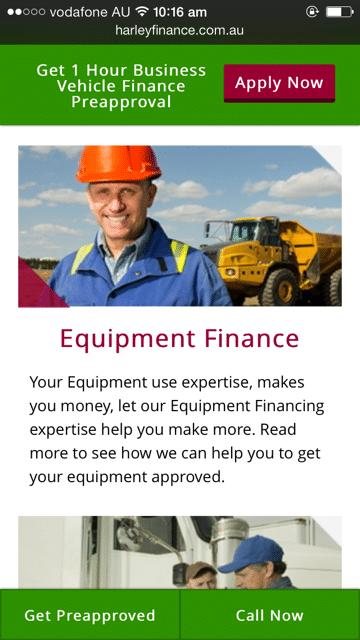 In tests, we frequently see carousels whose images have been adapted from a PC website. The text is too small and the images are too crowded for easy viewing on a mobile device. We also see many cases where the developer uses a mobile carousel to supplement site navigation. In other words, they bump some of the features from its PC site that won’t fit into the smaller mobile navigation scheme, into the carousel. This inevitably confuses customers who expect site navigation to be done through the site’s main menu. If you want to use image carousels, make sure that there isn’t too much text on the images. Some people predominantly use their mobile to browse. They then use their desktop to purchase. This means you need to ask customers who are mobile browsing, whether they would like to start up a shopping cart that can then be sent to them later in an email, so they can resume any time in the future from where they left of, and from any other device. The caveat to this advice is that it doesn’t work if you just insert an “email shopping cart” button and leave it at that. Suggest that you’ll email it, and explain why. For example, it might allow them to buy it after work or to discuss it with their spouse or to buy it from desktop or to share it with a friend. As mentioned in the Google Mobile Playbook, a whopping 68 percent of mobile searches actually occur at home where there are other, larger-screen devices available. This means that if people want to continue the shopping experience on a desktop device, they could do it right away if the website made it easy to do so. 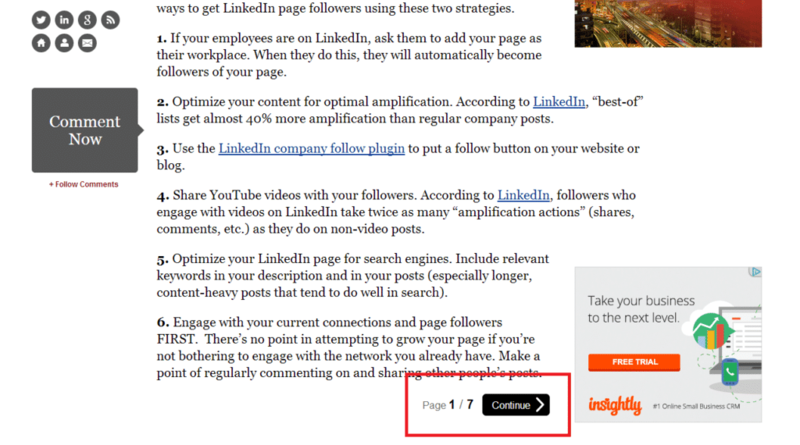 I get instantly turned off when I see an article that has several pages and I have to click on the next page to view the next part of the article. There’s no doubt mobile is going to play a huge role in our spending habits going forward. We may not have all the answers yet on how to best facilitate, capture or even exploit this trend, but there’s no excuse for poor preparation. As Benjamin Franklin so aptly stated: If you fail to prepare, prepare to fail. If you have any more tips that you would like to share with me or you wish to comment on these suggestions, may I encourage you to leave your feedback here or contact me directly.